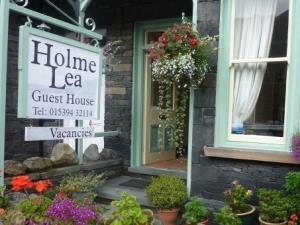 Holme Lea Guest House Guest HouseNewly refurbished, Victorian stone built property. Situated off the main through road, yet still centrally located close to all shops, restaurants and local attractions. Pleasant, airy rooms. The four main bedrooms have recently had the addition of en suite facilities. Family and single rooms available. Arrangements can be made for early or late arrivals. Children welcome from any age. From A591, go down Wansfell Road, opposite Hills garage. Turn right onto Rothay Road, keep in right-hand lane, following road round to the right past the bus station. Take the first left onto King Street, left again onto Church Street. Holme Lea is the first guest house on the right. Holme Lea guest house was very clean & welcoming. Perfectly positioned. I would not hesitate to stay again in the future.